It wasn’t too long ago when I went on a rant on society’s perspective (no pun intended) on athletes, expectations, and how their performance and actions somehow impact our life. And when our role models and heroes let us down, we take it personally. There’s this disappointment we feel when the first-round pick doesn’t live up to the hype. They’re human and can only do so much. Yes, these upper echelon athletes are one of a kind. They can run fast, jump higher, and hit farther, but underneath it all, they’re people just like us. The perfect example of the untouchable is Johnny Manziel. But, oh how the untouchable have fallen. Once one of the most highly touted quarterbacks in the world is no longer playing football. And why? He believed his own hype, we believed the hype, and no one could bring themselves to tell him to slow down. Take your time or you’ll lose everything. The looks, the fame, the money sign! Johnny Football had it all until he didn’t. And we, we glorified it on national television. He’s littered all over TMZ, and Wright Thompson of ESPN exposed Manziel for what he was; a young kid in the limelight trying to dealing with the constant pressure and stress of being the man. We’ve mocked Manziel for what he’s not; a loose cannon who drank it all away, but where do we stand now? We all love a underdog story and this one is no different. 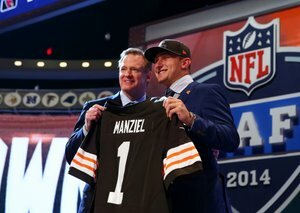 Manziel was the 22nd pick in the 2014 NFL Draft and it’s safe to say expectations were not met. In 14 career games he’s thrown for seven touchdowns, 7 interceptions and 1,675 yards. At 24 years old, he’s out of the NFL. It’s mind boggling to think that the poster boy for fame and fortune is nowhere to be found on Sunday afternoons. That could all be changing. Manziel has been staying out of trouble and staying sober (as far as we know). And you know what, good for him. Everyone’s written him off and he’s decided to to do what he’s always done; do it his own way. Sort of a backwards way to look at it since everything he’s done to this point has got him to where he’s at right now. Nevertheless, it takes a strong person to know when they’ve messed up. Currently, Manziel is looking to get back into the game, even saying he’d be interesting in coaching if his playing days are done. If the NFL doesn’t work out, the CFL is an option as his negotiating rights are currently held by the Hamilton Tiger-Cats.